This is a milder version of stretch n°16. Standing tall, hold the outer side of a post and push your hips away from that post. Muscles emphasized: glutes and external obliques. 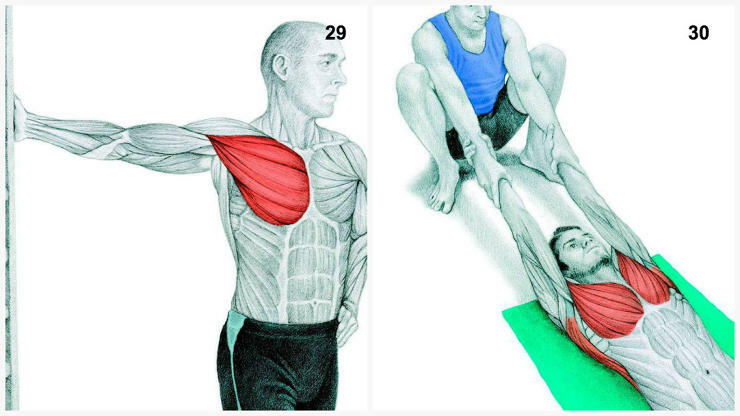 This stretch is great to relieve sciatica pain. Start by lying flat on your back with your arms on your side. Bring your left leg across your body and hold your left knee with your right hand. Take deep breaths to really open up your chest and rib cage. 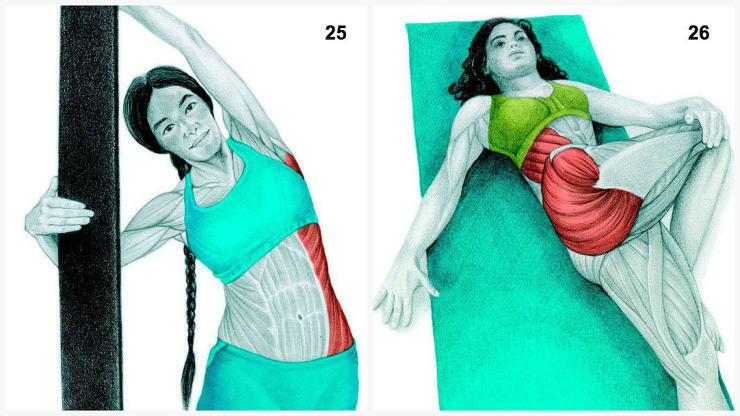 If this stretch is too hard for you, hold both knees towards your chest and gently rotate them to your left, keeping your back and head on the floor. Muscles emphasized: external obliques and latissimus dorsi. Stand tall with your hands above your head. You should be holding a stick or a towel, keeping your hands about a shoulder’s width apart. Gradually push your hips out to the side and keep your shoulder rolled back. If you have problems with your lower back, do not perform this stretch. Stand with your legs far apart, the left should be straight in front of you and the right behind you. Your back foot should be away from you at a 90° angle. Place your left hand on your leg in front of you and bend forward, keeping your back straight. Then, place your right arm towards the ceiling, slightly rotating your body in the process. Your head should be looking up. Start by facing a wall and place your right hand on that wall. Your hand you be turned towards the right with your thumb towards the ceiling. Gradually rotate your body away from the wall. You should feel this stretch in your chest and belly. Don’t push it too far or you can damage your shoulder joint. Muscles emphasized: chest and latissimus dorsi. You’ll need a partner to perform this stretch. Begin by lying down on the floor and holding your palms face up. Your partner should be seated in a deep squat near your hands. Ask you partner to hold your hands and gently pull them away from you. 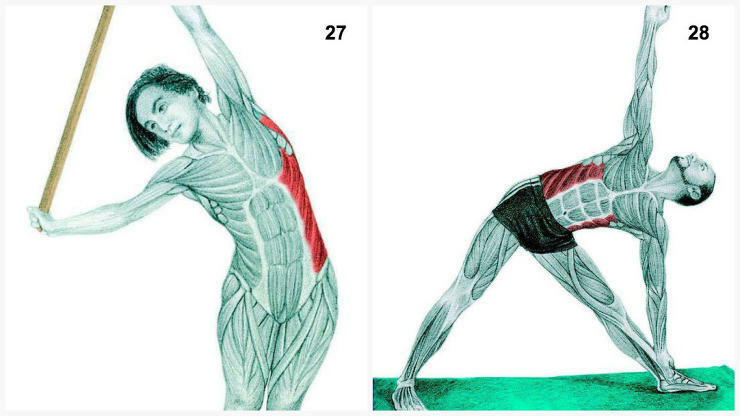 The stretch should affect your chest, arms and spine. Sit with your feet out in f­­­ront of you. Fold your right leg, bending at the knee so that your right ankle rests on your left knee. Place you right hand behind you and slowly bend forward. You can also rotate your body to the left to stretch your back. Lie flat on your back and place your arm beside your body. Your elbow should be at a 90° angle and your forearm should not be touching the floor. Gradually lower your forearm to the floor above your head. If you can’t reach, your rotator cuffs are too tight: loosen them up with a massage or physical therapy. Muscles emphasized: pectorals and latissimus dorsi. Stand far enough from a wall so that when you touch it your body is parallel to the ground. Lower yourself into this position by rotating your hips and keeping your back straight. Once in the proper position, move your chest forward and make a slight arch in your upper back to stretch your lats and chest muscles. You can also bend your knees to really get into it. Once again, you’ll need a partner for this exercise. Start by lying face-down on the floor. Your arms should be along your body with your palms face down. Your partner should stand above you at hip height and pull your hands upwards and back. You should feel a deep stretch in your chest muscles, but it’s not recommended for people suffering from shoulder pain.